Andrew Gillum -- who DFA enthusiastically endorsed early on in June of 2017 -- has delivered a shocking, massive upset victory in the race for governor of Florida, defeating several formidable candidates in a crowded primary field. 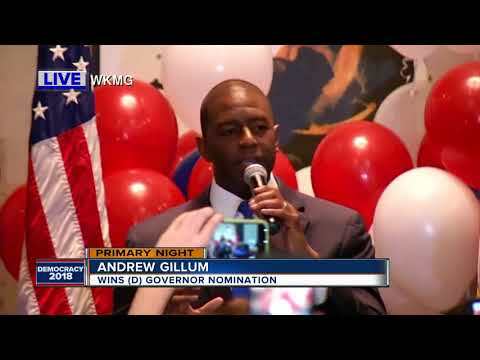 The energy and momentum in Andrew Gillum's campaign is real. The policies he supports -- Medicare for All, a $15 minimum wage, criminal justice reform -- are what Democracy for America members are fighting for across the country. That's why Bernie Sanders endorsed Andrew Gillum. He was clearly the most progressive candidate in a highly competitive race for governor of Florida -- and now, like Stacey Abrams in Georgia, he has a chance to make history in Florida as the first Black governor in that state's history. While we celebrate Andrew's major victory, we've got to set our sights on November to defeat Trump Republican Ron DeSantis and flip this important governor's seat in a critical swing state. Will you chip in $3 right now? Thanks to an army of grassroots organizers, Andrew shocked the world because he built a movement that inspired new and infrequent voters in the New American Majority with bold, inclusive populist ideas that speak directly to the challenges Floridians face. As Mayor of Tallahassee, Andrew Gillum beat the NRA in court to protect common-sense gun reforms, stood up to Donald Trump and Rick Scott to defend immigrants, and reduced violent crime in the city by investing in community policing and juvenile justice programs.